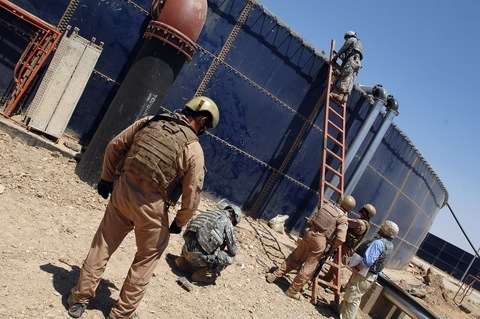 Officers of the U.S. Army Corps of Engineers inspect the U.S.-funded wastewater treatment plant in Fallujah, Iraq, on July 23, 2010. Photo by Scott Peterson/ Getty Images. Click on photo to view the inspector general report. 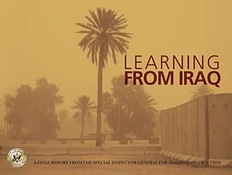 Read the full report: Learning From Iraq: A Final Report From the Special Inspector General for Iraq Reconstruction. The nine-year rebuilding program in Iraq was the second largest — after Afghanistan — ever undertaken by the United States. The Development Fund for Iraq set up to disburse the funds was poorly controlled and subject to “fraud, waste and abuse” a review in 2005 found, the report said. Part of the problem was the Defense Department handled the contracts and the State Department managed the rebuilding policy, leading to “different masters with different agendas” and project disarray. A new Provincial Reconstruction Team program started and took off in 2006, but the following year, heightened Sunni-Shiite violence upended oil and electricity programs and redirected attention to security and battling extremists. The inspections continued and the team developed a program with the Justice Department in 2009 to pursue and prosecute cases of fraud, before heading into a period of transition in ensuing years. 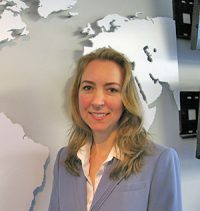 The report lists seven lessons learned from Iraq: create a civilian-military office for rebuilding activities; start rebuilding only after having sufficient security; ensure full participation and cost-sharing with the host country; establish uniform contracting and personnel rules for all projects; require oversight of all projects from the beginning; refine the programs that did work in Iraq; and plan ahead with back-up plans at the ready.